We've just added a new product, and it is very exciting indeed. It's the Cheshire Cat kigurumi costume. The Cheshire Cat is a character from Lewis Carroll's Alice in Wonderland story. It has a big wide grin and the ability to disappear and reappear at will, which it does throughout the story. In various incarnations of the story, the Cheshire Cat has been male and female, a good guy and a bad guy, and has been played by actors including Whoopi Goldberg (in a TV series) and Stephen Fry (in the 2010 movie). However this kigurumi is the Cheshire Cat as imagined in Disney's classic animated movie Alice in Wonderland, in which he's a bit of an anti-hero getting Alice into mischief all the time. It's an official Disney-branded product and in line with the 1951 movie, the Cheshire Cat kigurumi has a distinctive pink and purple stripy body as well as maniac bright yellow eyes. It's made of soft polyester fleece, so will keep you warm and snug (as well as looking hilarious). It fits adults up to about 6'1", which is about 185cm tall. 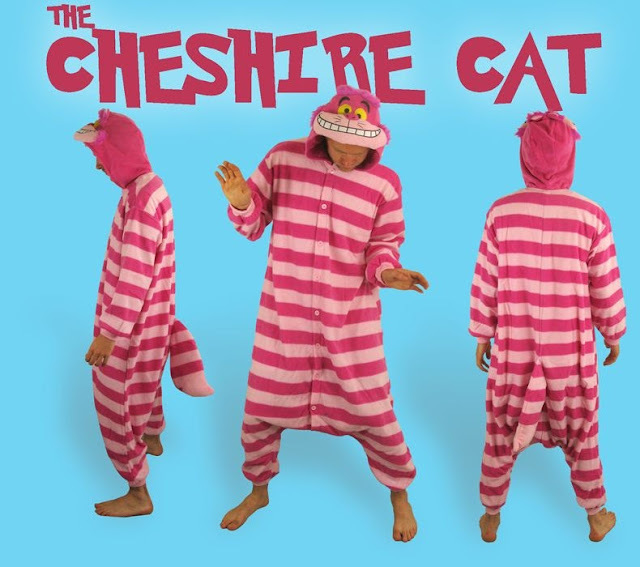 We think the Cheshire Cat costume is perfect for anyone with a mischievous edge to their character, or for anyone looking for a nostalgic character costume or onesie. You can buy it here.